For the most part of the year 2017, Jupiter will be in the air sign of Libra. Jupiter entered Libra last year on September 9, 2016 and will stay in this sign for 13 months until October 10, 2017. The theme for achieving success in 2017 revolves around honing your ability to work fairly, maintain group cohesiveness or team spirit, and to compromise, adjust or negotiate diplomatically with others. Those who seek to maintain peace and harmony this year will be richly rewarded in personal and professional relationships. Cultivating good social skills and utilising charm and grace in your interactions with others can take you places. In general, collective interest in learning more about balance in relationships, legal rights, social skills, psychology, and soft skills can be observed. Jupiter is considered similar to Santa in astrology as it is a giver of good luck and gifts. Jupiter brings opportunities for growth and expansion in knowledge, understanding and life experience. Jupiter's move into Libra will affect every one of every sign positively but most growth opportunities can be seen in the house it enters in your sign. For instance, Libra will benefit the most in 2017 from this transit because Jupiter will move into their first house of self -identity, glamour and personal appearance. Librans have been chosen to stay in the limelight! As the year begins, Venus will enter Pisces on January 3, 2017 for a period of one month. When Venus will be happy to be in Pisces and will encourage the expression of unconditional love. Venus in Pisces encourages interest in beauty, arts, creativity and altruistic activities. You may feel more inclined than usual to extend a helping hand to someone in need. Romance may blossom now and you may spend good times with your beloved. For those already in committed relationships, faith in the potential of relationship may be re-established. On January 28th, 2017 Mars will leave Pisces and enter Aries and will stay there until 9th March 2017. This transit of Mars in Aries will inspire a sense of courage and you may be more inclined than ever to take action and to lead the pack. However, be cautious not to make others feel intimidated or undervalued. It is important to be a little careful and attentive in the eclipse season. Eclipses cause a lot of upheaval and are known to accelerate the pace of events by bringing about sudden change in our lives. Eclipses are notorious for bringing to light hidden truths and secrets. There will be two sets of eclipses in February and then later in the year in August. Leo, Pisces, and Aquarius will feel the effect of these eclipses more than most. There will be a Lunar Eclipse on the 10th of February in 22° Leo 35' ,followed by a Solar Eclipse on February 26th 08° Pisces 10' . During the year 2017, Mercury will go retrograde four times. The first retrograde cycle will occur from Dec 19, 2016 to Jan 8, 2017 in earthy Capricorn. During this time, you should be more careful in matters of money. The second time Mercury will retrograde from April 9 - May 3, 2017 in Taurus which is also an earth sign. Mercury will retrograde for a third time this year from August 12 - Sept 5, 2017 in earth-sign Virgo and will culminate in fire-sign Leo. The final retrograde of mercury for this year will occur from December 3 - December 22, 2017 in fire-sign Sagittarius. It is a general rule not to buy expensive things (especially electronics) or sign new contracts during mercury retrograde periods. However, Mercury retrograde is a good time for revising your plans and re-doing projects that were not up to the standard. Yearly 2017 horoscope for each zodiac sign. Follow the 2017 Horoscopes directory links below and choose from general, love 2017 horoscope, career 2017, 2017 Landmark Dates, finances 2017 and health 2017 horoscope for the 2017 year of Rooster. 2017 is also the year of the Fire Rooster according to Chinese astrology. Rooster has traditionally been associated with rising up with the dawn and being out- and- about and this indicates why hard work and discipline will be the key to success in the year of the fire rooster. Rooster years are governed by the fire element which will create tension and imbalance due to conflict with Metal which is the main element of the rooster. Yin (feminine) energy predominates this new cycle. Yin years favour maintaining privacy in personal and business matters and spending time quietly with close friends and family. Rooster years are great for building the virtues of good judgement, sense of righteousness and patience. New insights can be gained in the areas of public administration and business by those who endeavour to cultivate the virtues that the Rooster holds dear. Risky ventures and impulsive investments should ideally be avoided this year. The political climate is likely to be unstable and any haste in business matters can result in failure. You'll be greeted by success if you persevere and strive to remain honest and organised to reach solutions to problems this year. The year of the Fire rooster brings warmth in relationships and is generally a good year for new romance and weddings. This new cycle from January 28th, 2017 to 16th February, 2018 can be a productive and rewarding time for the Chinese sign of Rat, Ox (Buffalo), Snake, Goat, and Rooster. It is likely to be a moderate year for the Chinese sign of Tiger, Rabbit, Dragon, Horse and Pig. However, the Chinese sign of Dog and Tiger need to be a little extra careful in most aspects this year. Free 2017 horoscope for the 2017 year of the red Rooster, annual 2017 horoscopes for your western zodiac sign. Free 2017 western horoscope for the period of the year of the red Rooster . 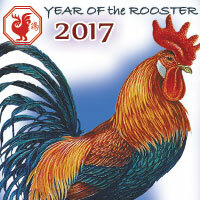 Free 2017 western horoscope for the period of the year of the red Rooster.